Again good work and a good idea. I've been fooling with the idea of unstranding the 3 ply Mason line keep the air restance down on the lines and adding some to the finger loop and pocket... It would seem that some of the fishing net that is left over from my guillie suit could be worked into the sling...Prehaps tomorrow I'll find some "round-tu-its" and get around to working on it . I've got some a few irons in the fire but at least 'am at home with the dreaded "colander-phones" and my P.O.S. digital cam. I might try a couple of test shots with the thing to see if I can send shots to someone just to see how this all works. Granted it might not all be sling related as my "test box radio" is still picking up some good long range reception. Very cool sling! It's neat how you can make that netted pouch out of the same lines for the cords. I have been playing with a single strand net pouch sling for my sons to throw whiffle balls. If it works I will find someone with a digital camera. OMG lol i was gonna do something like this... but i was way too lazy :- hahahaha im a lazy bum. I've started... It isn't tough at all (esp. 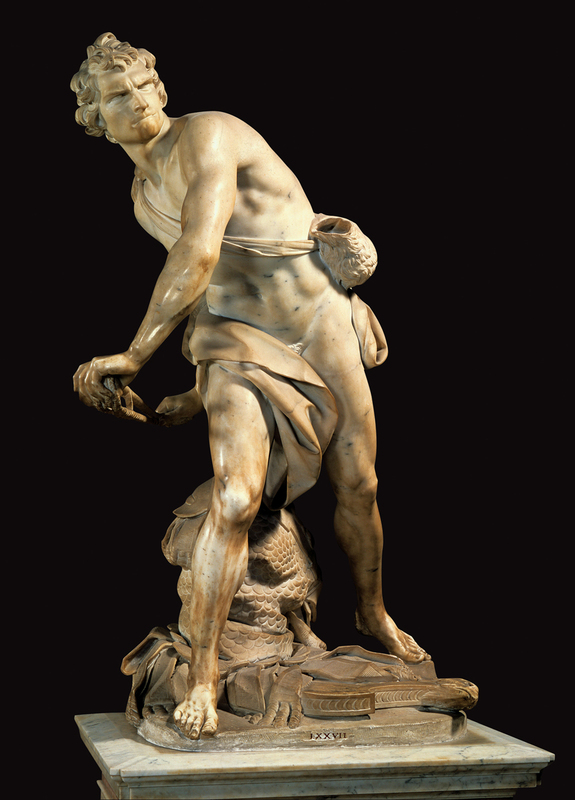 compared to some of the artwork in the gallery) I think I could knock one of these up in about 10-15 min. I'm putting an article together that will cover the net pouch. I like the second design better from an economy of design point of view, and it is adaptable to diffferent materials. The first one is probably a "better" sling (lower aerodynamic drag). The next one will further refine the idea. Ok, here goes... (knots are pretty hard to describe unless you are working with a common vocabulary... I'll try pics) I'm guessing at the embedded pic tags, If Chris changes them I'll edit the post - they won't show up at first. This was a first experiment. The twine used was 3.5mm polyethylene/polyester braid (8 strands of each) with a filament polyethylene core. We use a range of fibres in trawl nets, up to and including dyneema/kevlar. The modern PE twines match up pretty well with the super-high-tech stuff, at much lower cost. The challenge here was to make a sling with ONE piece of twine. The sling was eye-spliced in the middle for the retention loop and "sleeved" until the split. The core was withdrawn from 3/4 of the length and braided. The two halves (both sans core) then rejoin coax style again until the retention knot. In the photo below, end 2 is spliced for the loop, and drawn through the hollow core until the pouch split. End 1 (with core) is spliced into the hollow end 2. You can use "real" splicing tools, or you can tape a point onto the end that you are threading. Taping the end to a piece of wire or similar can make it easier too. The top image to the left shows the path that I netted the pouch with. A further refinement would be to carry the number of cords needed through the sling cords, or split a larger core into several. Even numbers are probably better - 6 seems to be about right. 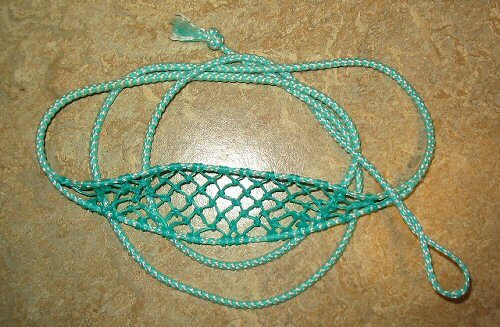 A planned refinement is to try another sling using a twelve strand round braid for the cords, split into 2 three strarnd braids for the pocket edges and 6 for the netting. All 12 strands rejoin in the release cord... The lower pic might help explain. 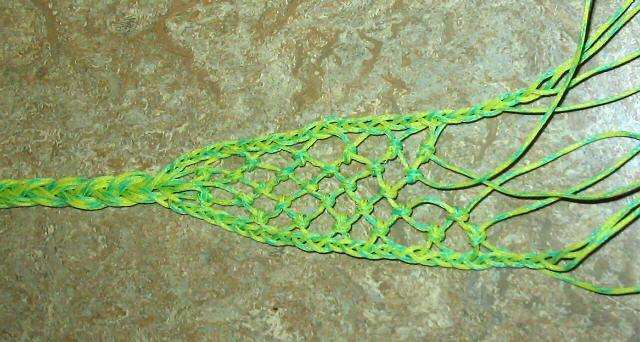 I think this will be a pretty elegant braided sling - a little different. And here is the crux... Netting is easy once you get the hang of it. Watch Greek fishermen mending their nets for a knot speed tying clinic. Traditional diamond mesh nets used to be made by hand using a netting needle to hold twine and a mesh stick to gauge the size of the meshes. The mesh in the sling is too tight for a needle, so I had to thread the knots by drawing the entire length through each mesh. The mesh stick assures consistency, but isn't neccesary - I used a pencil for some of the meshes and the corner of my pinky for others. The first row of meshes is cast on the sling cords using Clove Hitches. Lark's Heads could be used to, but 98% of fish nets use clove hitches - there must be a reason that I don't know; I'll ask my friendly neighbourhood Icelander next time I see him! The knots used to make the net are Sheet Bends. When tied in a net they are known by various names, including Netting Knot, Weaver's Knot, Mesh Knot... They can be tied a few different ways, depending mostly on what village or island you grew up on. The pics describe it better than I can. Using the technique shown is quite a lot faster and more accurate than methodically tying individual sheetbends the way most people are taught. The mesh stick (shown with the hanging meshes looped around) gives you nice even meshes. 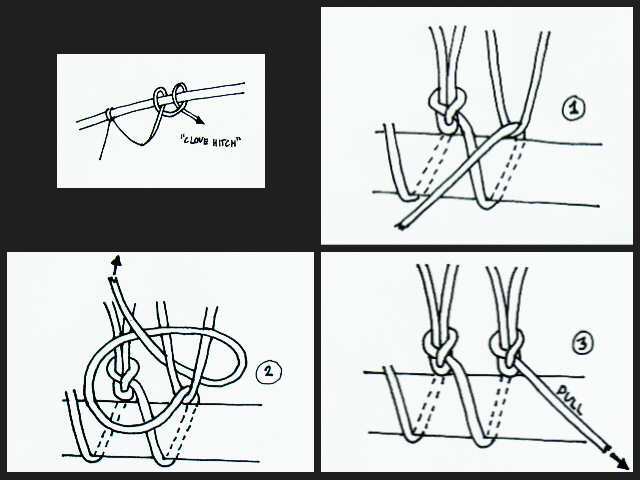 Care must be taken when drawing the knot tight to avoid "capsizing" the knot - at this scale it is a little bit easier to misform the knots. 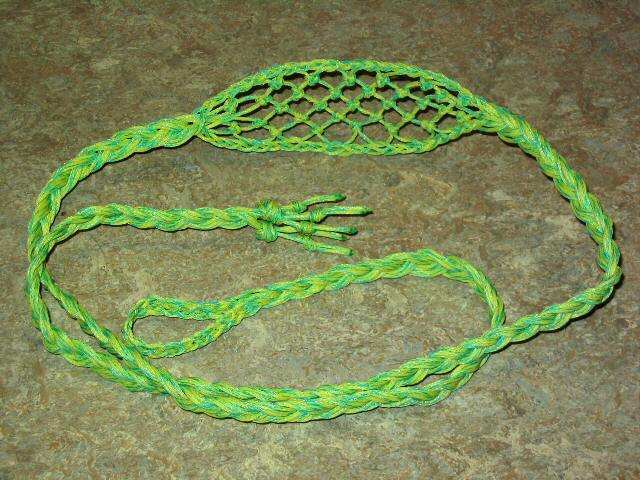 Try practicing with larger meshes and twine before tackling a sling pocket - it will go much smoother. The pouch on the green sling tapers at the ends in a mostly freeform way. I think the second design with all six strands carried through to the ends might be a little tidier. Well I got to thinking (stop running for cover, my brain probably won't explode) about the idea and come up with what might be a good idea. It would cut down on time and the air drag from the lines. I'll try and discribe it the best I can. Again this is still in the R&D phase (locked away in my strange mind) but it would seem to make since. I'll fool with the idea tonight (or atleast this weekend) using ready made net stiched to the pouch frame. I'm in the process of moving and am pretty much out of steam. 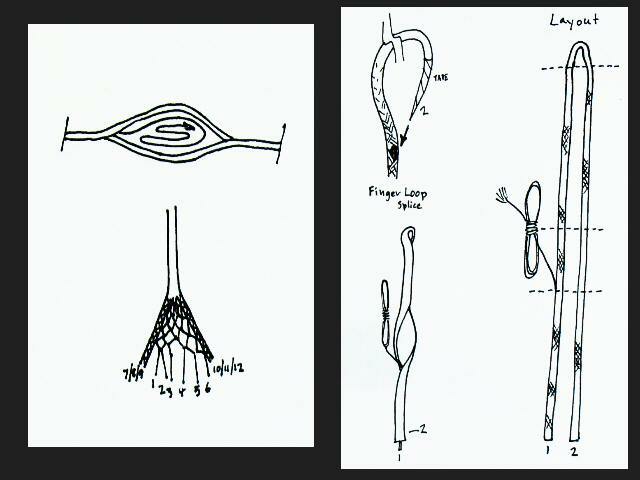 GOBLIN,it requires at least 9 cords to make a pouch,9 braided cords=thick string=high drag,if I use a leather pouch I only braid 3 cords,3 braided cords=thin sting=low drag. it wont be much drag at all i got a design on lock down. i will post pics when i got it done.... it should look totally amazing. i got all of my ideas to the awesome post about "Air Drag On Sling Cords & Pocket" . i feel that it wasn't a very creative idea since none of them were my idea's. but none the less, it should look cool and i think you guys would be surprised to see what i have come up with. let you guys know when i am done. Pretty darn cool. You have my admiration here. I saw pictures of Peruvian slings made with netted cradles. The netting is composed of interlocking flatbraids the detach and attach again to two main larger flat braids on the outside of the cradle. That might be worth some development itself. I believe Hondero has a picture in his sling museum, if I'm not mistaken? Otherwise, see "Sling Braiding Of The Andes."